This year, Pacific Crest and e-Adjudicate partnered together to offer a unique experience to 200 high school students at the 2017 Drum Corps at the Rose Bowl show. 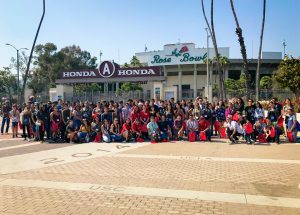 As part of The Next Step Student Experience hosted by e-Adjudicate, the students were invited to the Rose Bowl for a behind the scenes look at one of the season’s biggest drum corps events. “This was the first time we’ve done this event, so we were excited to have over 200 students, all from Southern California” said Scott Bilbruck, founder of e-Adjudicate. Outside the stadium, students participated in a meet-and-greet and ice-breaking activities before walking down the tunnel and onto the field, where they marched some of their own drill spots and had a Q&A session with two of Pacific Crest’s leaders: Sabrina Thomas (Drum Major) and Marissa Espinoza (Color Guard Captain). The event is part of The Next Step Movement Academy offered by e-Adjudicate, a three-day camp that gives band and color guard students the chance to to train with some of the top movement instructors on the West Coast, gaining valuable skills for the upcoming marching band season. Interested in being part of the Student Experience next year? 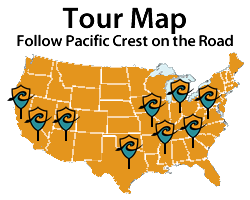 Learn more about student leadership opportunities at e-Adjudicate Academy.